While much of the focus of the African American Read-In are novels and trade books, let’s kick off this month looking at books by these NCTE-published authors. Confronting educational inequality, the National Council of Teachers of English proposed the “Students’ Right to Their Own Language” (SRTOL) Act in 1974. This resolution begins: “We affirm the students’ right to their own patterns and varieties of language – the dialects of their nurture or whatever dialects in which they find their own identity and style . . . ” (p. 9). This resolution was reaffirmed in 2003 due to its contemporary relevance. 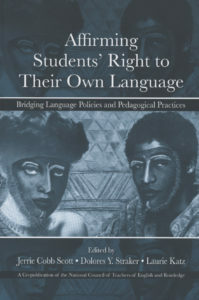 As an anniversary publication, Affirming Students’ Right to Their Own Language: Bridging Language Policies and Pedagogical Practices is devoted to examining the results of the resolution, to strengthening the connection between pedagogy and policy, and to drawing attention to language ideologies. 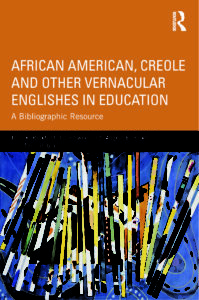 African American, Creole, and Other Vernacular Englishes in Education: A Bibliographic Resource includes more than 1,600 references on education in relation to African American Vernacular English (AAVE), English-based pidgins and creoles, Latina/o English, Native American English, and other English vernaculars. Read a review of this book from Teachers College Record. 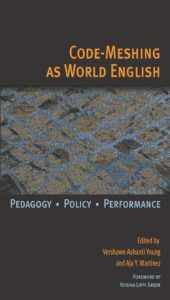 A collected volume of original essays, Code-Meshing as World English: Pedagogy, Policy, Performance, presents code meshing (blending dialects and languages with standard English) as the better pedagogical alternative to code switching (shifting between dialects or languages in different settings) in teaching literacy to diverse learners. In this interview, editor Vershawn Ashanti Young discusses and defines code-meshing. 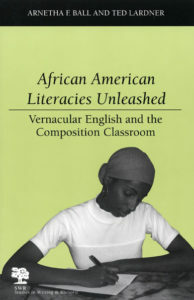 Come back next week as we continue to look at NCTE texts during the African American Read-In.